Hello superstar readers! I would like so start out with one more jumbo sized THANK YOU for last week's love. Taking a few days off has definitely done me some good. 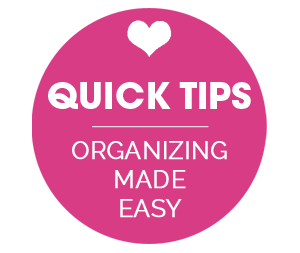 Although I am not diving back into a full time posting schedule just yet, I have been planning out a few new post ideas that I am really excited about. I was also able to log quite a few hours finalizing the release of my 2016 planner, which was really fun for me to focus on. 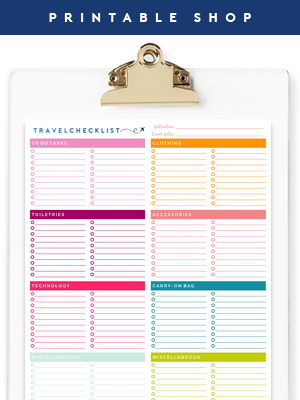 For those of you waiting on the new printables, I sincerely appreciate your patience and hope to have them out to you very soon. I have mentioned in a few recent posts that with our oldest son starting High School this year, our gift to him is a bedroom that better fits his age and lifestyle. We had already done a few things for his space over the past couple of years, but now I am on a quest to finish it up and create something a bit more cohesive and functional. So far we have DIY'd a wall study organizer and organized his newly painted armoire. 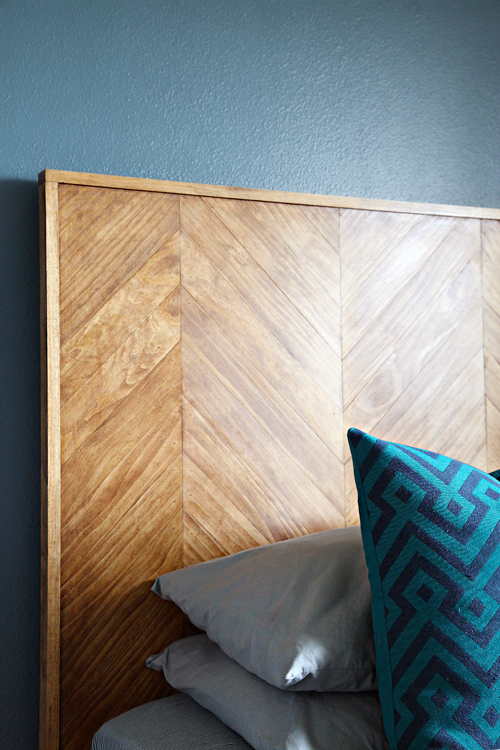 Today, I am sharing the headboard we recently built for him, which is now the new focal point in his room. 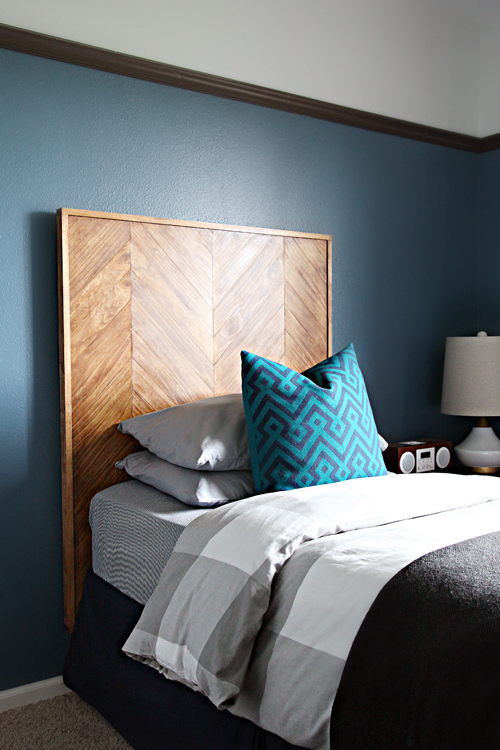 Bryan and I have been wanting to do a herringbone wood project for quite a few years now, so when we discussed potential headboard patterns with Preston, we were excited with his selection. 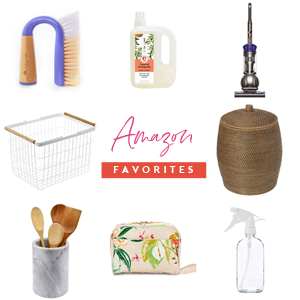 Although some folks may be ready to say farewell to herringbone as the chevron trend fizzles, I think it is a fantastically classic pattern that we will continue to love for many years to come. 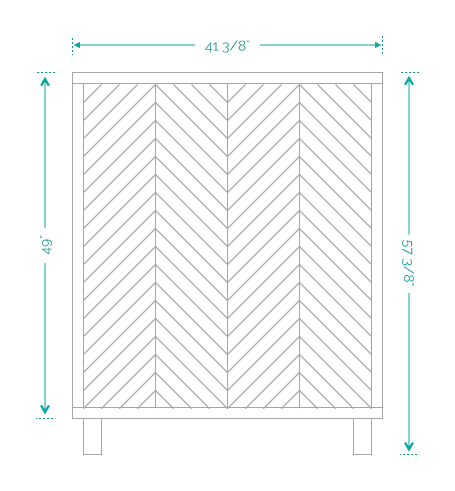 To come up with the final size of the headboard, we added a couple of inches to the width of the mattress and selected a height that would allow the pattern to remain visible above a stack of pillows. 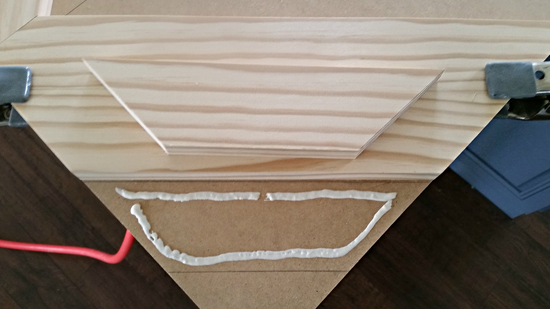 To get started, we drew a template on the piece of MDF to determine measurements and angles (all angles ended up being 45 degrees). We drew the first line down the center of the board and divided it into four sections to create the pattern. Then we used one of the 1" x 3" boards to trace the correct pattern size. 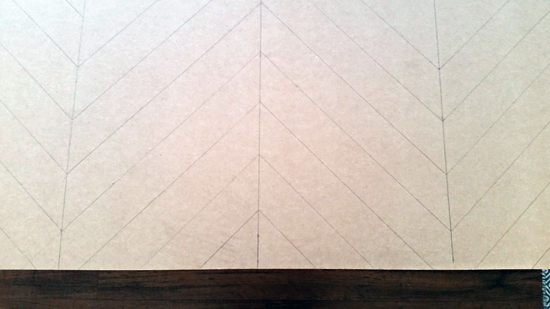 The next step was to cut the 1" x 3" boards to fit the pattern. This was one of "those" projects in which I figured we would just pre-cut all of the boards, glue them in place and call it an easy peasy day. 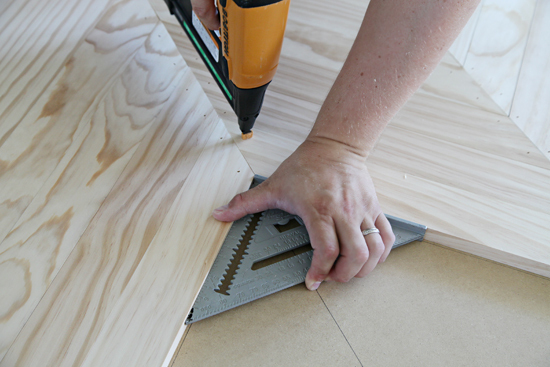 Then, Bryan stepped in and decided to measure and cut each board specific to the placement on the MDF board based on how the pattern was evolving (to prevent any cuts from being too long or short or creating imperfections and gaps). 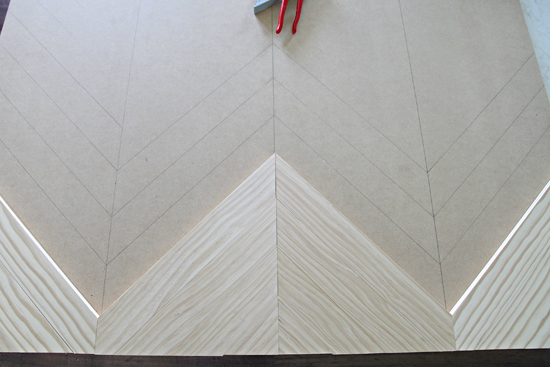 The basic steps for this project were to measure, cut, glue, nail and repeat until we completed the entire pattern. 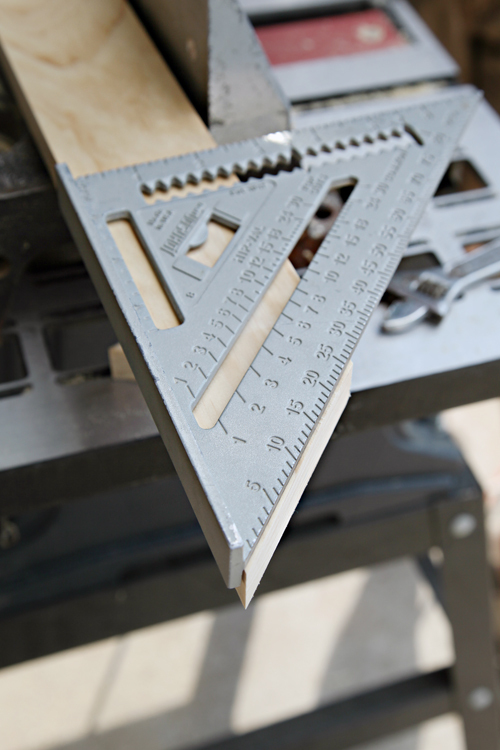 The carpenter's square was helpful in drawing the 45 degree angles on the 1" x 3" boards. 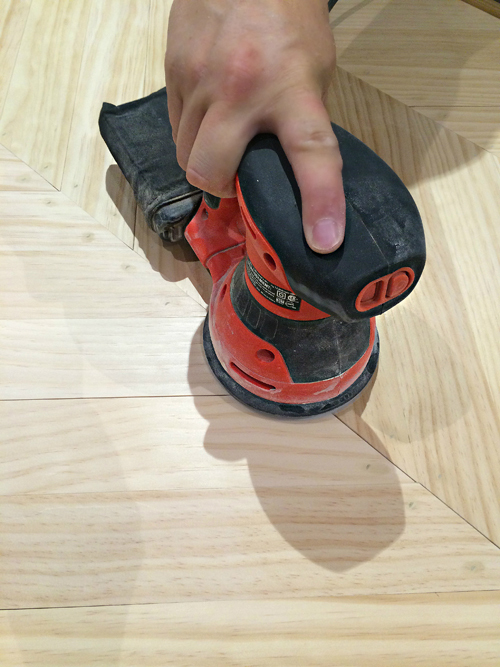 All of the angled cuts were done with the miter saw. 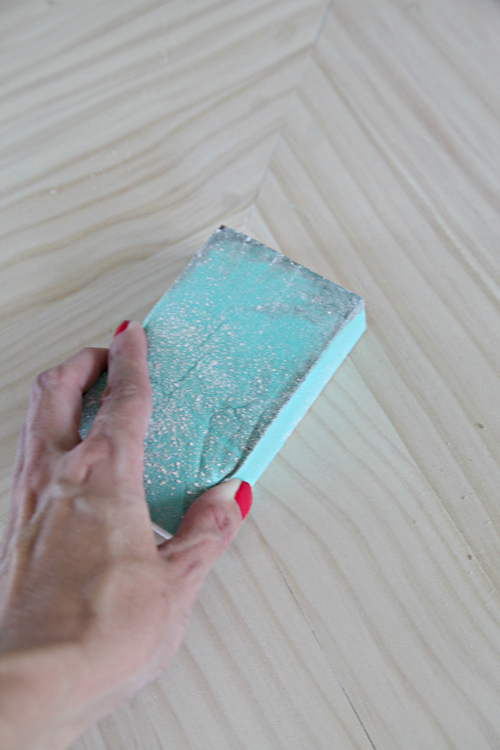 Once a board was cut, it was affixed to the MDF with wood glue. We initially started the project by also nailing the boards up through the back to prevent the show of any nail holes, however, this was essentially doubling the entire time of an already long project and became more and more challenging as we worked our way to the center of the board. Eventually, we switched to nailing on the front side. 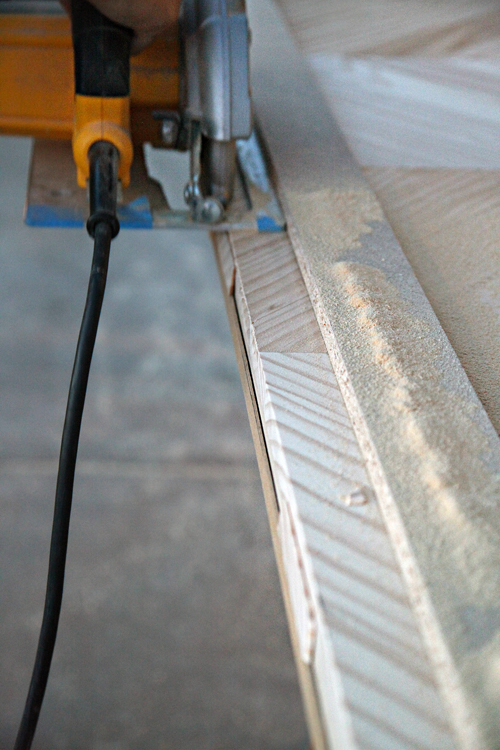 The carpenter's square was also a really nice aid in keeping the boards straight while nailing. 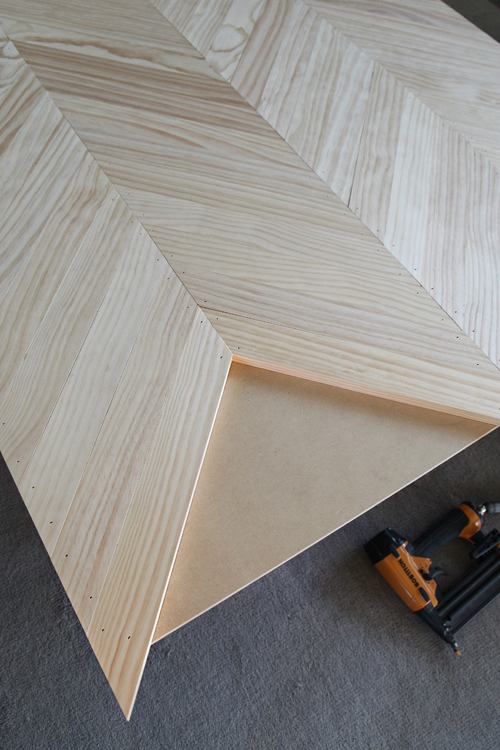 The plan from the beginning was to cover the entire piece of MDF with the pattern and use our circular saw to slice down each edge of the headboard for a nice and straight finish. 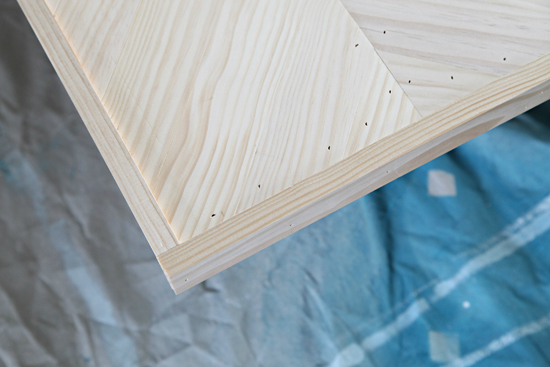 So as we went, the final pine pieces began to hang over the edges of the MDF board. We used the saw to clean up the perimeter prior to trimming it out with the 1" x 2" boards. The next step was to fill the visible nail holes. This normally doesn't make me think twice when we are painting something (we just use whatever wood filler or painter's caulk we have on hand), but being that we were staining this decorative piece of furniture, I wanted to keep them as discreet as possible. 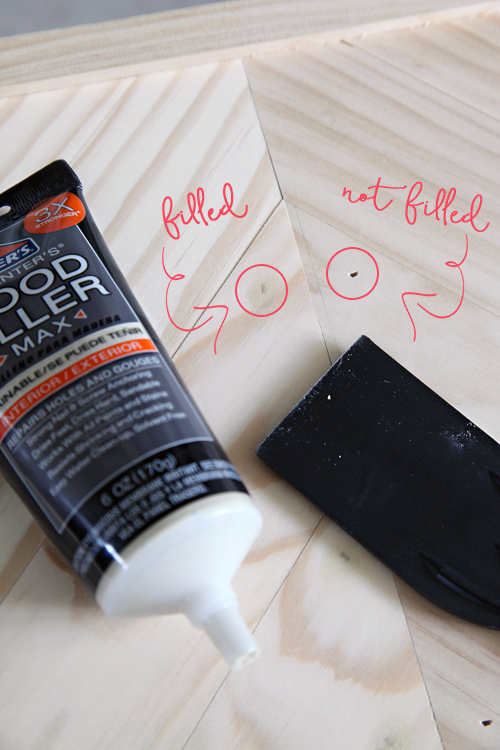 I found a stainable wood filler at Home Depot, as well as a plastic putty knife. I filled the holes by placing the wood filler on my finger and rubbing it over the hole. I followed behind by scraping everything nice and smooth with the putty knife. You will know you did a good job if your fingers look like they could be the starring role of a horror film. #gross After washing up, I went over the entire headboard with a fine grit sanding block and followed up with a vacuum and a slightly damp rag to remove all of the dust. Once the putty was dry, I grabbed the pre-stain, stain and polyurethane. Being that I wanted a consistent finish over the entire headboard, I began with a pre-stain wood conditioner which I applied with a brush. 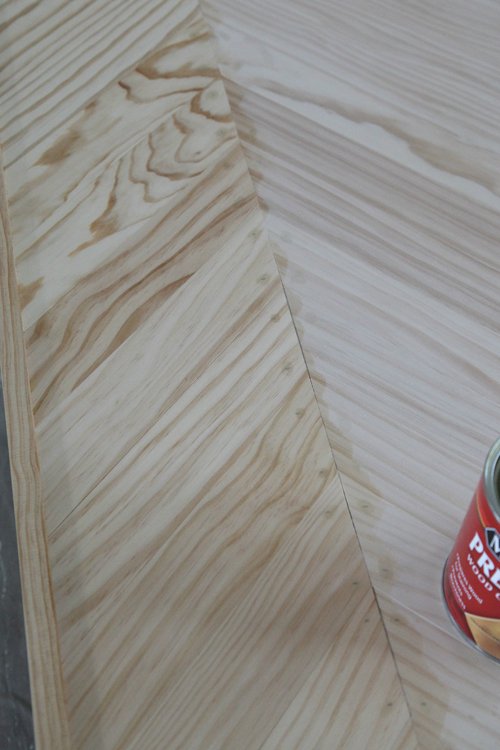 After the pre-stain was applied and dry, I noticed that the wood filler became a bit more prominent because it absorbs differently than the actual wood. 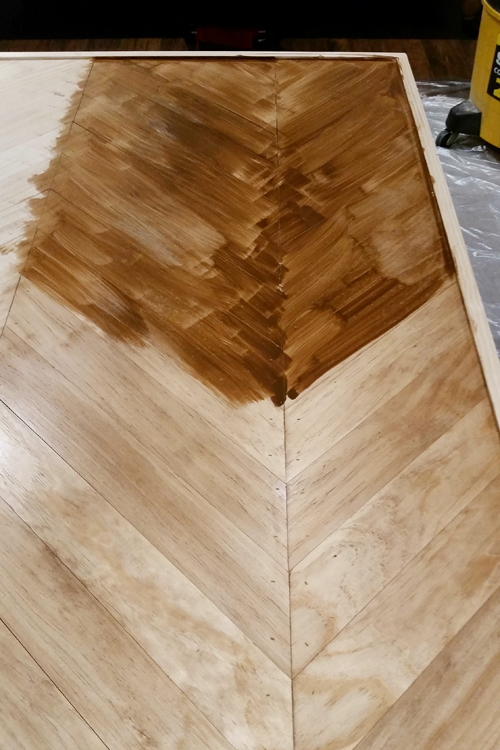 So, we went back over the entire surface with the palm sander to remove any excess filler and ensure everything was super smooth. I applied one more coat of the pre-stain as well as two coats of Early American by Varathane (the same stain finish I used on the wall organizer). I used a brush to apply the stain in the direction of the wood grain, let it sit for a couple of minutes and then wiped it down with a soft rag (a foam brush also works well for staining). I waited 24 hours before applying the second coat of stain. The nail holes were still slightly visible, but the second coat really helped to disguise them. Another 24 hours later I applied a coat of the Triple Thick Polyurethane (which dries clear and only requires a single coat). The initial plan was to hang the headboard on the wall, however, once it was finished it was extremely heavy. 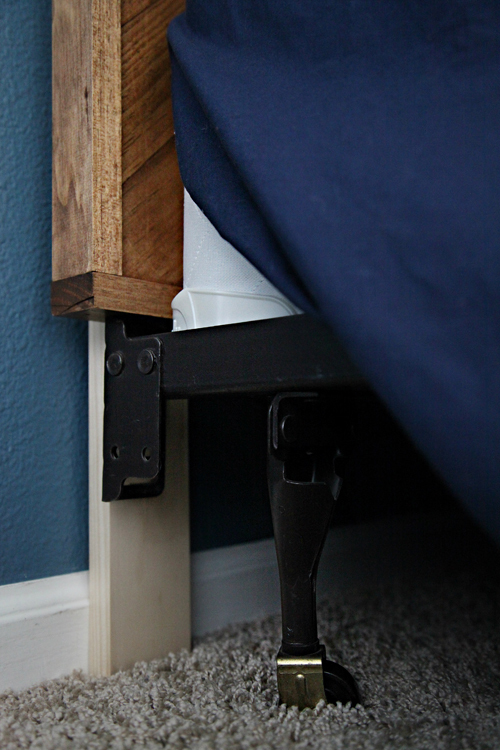 We ultimately opted to affix the headboard to the bed frame by adding two legs with some scrap 1" x 2" boards, which were screwed to the back of the MDF. Preston sort of initiated this makeover by moving his bed to the center of his room one day... Now it is the statement maker of the entire space! The warmth of the wood partners really nicely with all of the blues and grays throughout the room. We still have a few things planned to really finish up the space; such as adding in some art, photos and personal items, as well as updating the lighting situation. I am still toying with the idea of adding a very subtle pattern to the upper portion of the room (and maybe even painting the decorative moulding). Once I finish installing the remainder of the items and organize a few of the piles sitting in the corner, I will show how the entire space pulls together. Until then, you will find us all randomly popping our heads into Preston's room just to ooh and ahh at our latest project. That's not at all annoying to a teenage boy, is it? We always learn something with each project and maybe would have done a thing or two differently. It was not necessarily difficult, just extremely time consuming with the amount of measuring and cutting it required (a perfect project for a day of watching football). We definitely could have simplified the pattern and cuts but I am so very happy we didn't. And if you really wanted to prevent any nail holes on the face, I think the pieces could have simply been attached with a construction grade adhesive, and they would have remained in place just fine once framed out. So gorgeous!! And glad you had a few days off! Hope you are feeling relaxed and refreshed!! Love it! Well done Jen (and Bryan of course! ☺). I think its just the right amount of 'grown up'. Such a lucky lot of boys you have! We once made a queen-sized headboard that also ended up being quite heavy. We were able to hang it using a simple French cleat that my husband created out of scrap wood. It works really well! So classic! I'd like that for my bedroom! This is beautiful!! You guys are just the craftiest! Seriously! Love the extra height. Really makes it a statement piece. Heirloom quality for sure! What an awesome project for him Jen! It looks great!! Pinning and sharing for sure!! Would you mind sourcing the sheets and duvet? Thanks! Absolutely! Sheets were from Target a few years ago (similar: http://bit.ly/1Om5Zc3) and they are paired with simple gray pillowcases. The duvet is from West Elm last year (similar: http://www.ikea.com/us/en/catalog/products/90261408/). That's gorgeous! 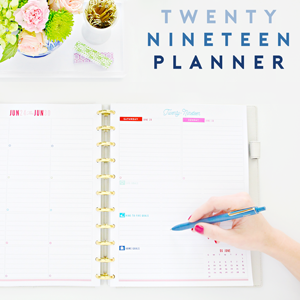 But I can't get over the 2016 planner update! I'm so excited!!! I'm trying so hard to be patient. Thank you and me too! ♥ Very excited to get it released! 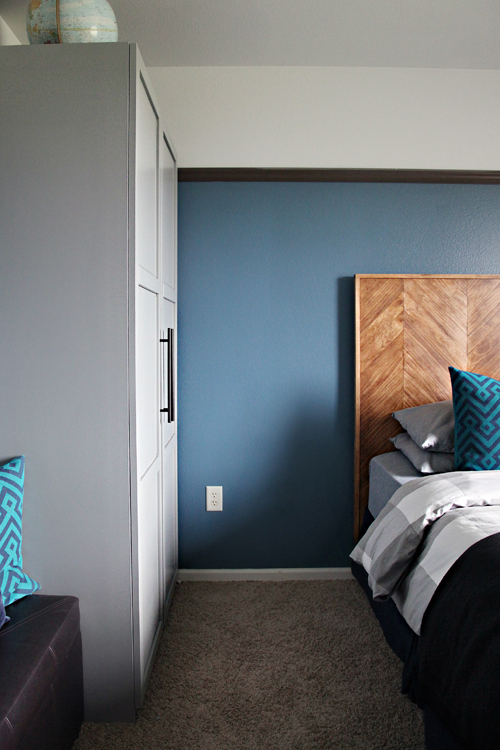 The deeper blue wall color is Behr's Cayman Bay and the upper portion is Sherwin William's Nebulous White. Beautiful! It makes his room look so mature! Love it! I still really like herringbone when it's done in wood, brick and tile. When there aren't the strong contrasting strips, it feels more classic. This is stunning. I love the design and the stain color. Great job! Oh my goodness, Jen this looks so good! I love the look of the wood against your son's dark walls. You did a great job!!! Great tutorial! Thanks for all the tips and advice. 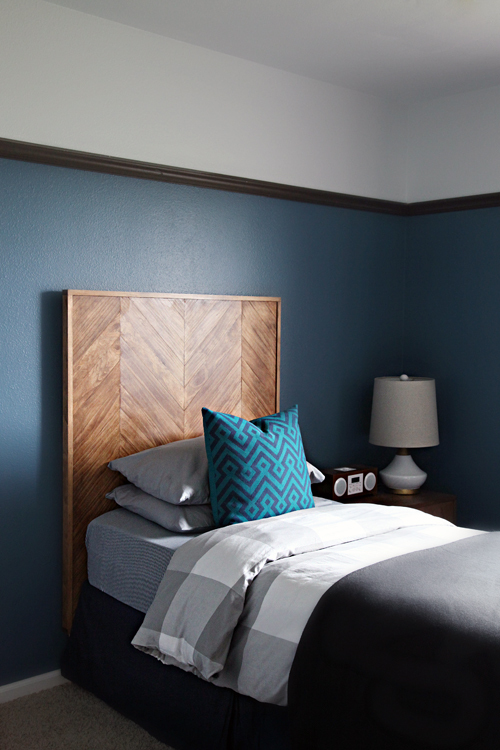 Your headboard turned out great! I agree that despite chevron's trendiness and sizzling out, herringbone is always classic, especially when you do it in such a sophisticated way. 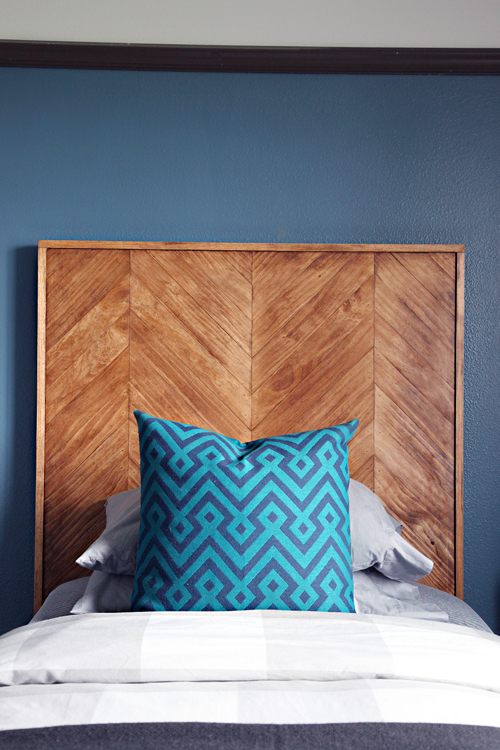 My husband did a herringbone table-top, and we've done a wooden headboard, so this is the perfect combination of those projects and a must-try! Oh goodness. This is gorgeous! 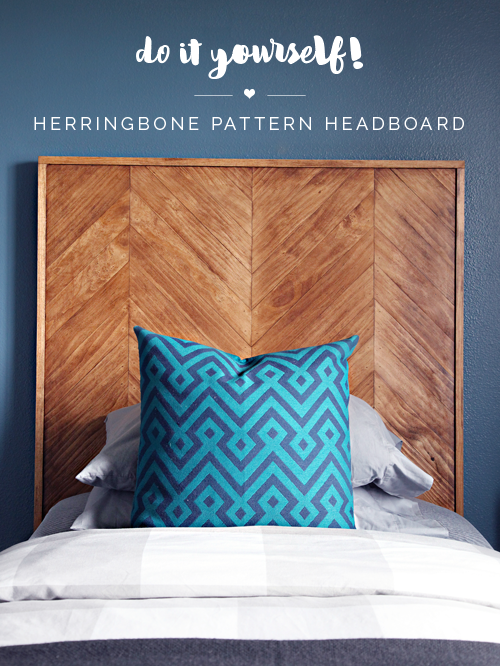 I agree that herringbone is timeless. 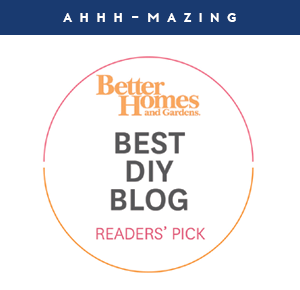 I was pretty set on DIYing a tufted headboard for our master bedroom, but now this has me rethinking... what a neat thing for him to be able to grow with! Would you mind sharing the cost of this project? It looks amazing, but I'm curious how the cost stacks up next to a purchased piece. The price will really come down to the materials you already have on hand and the type of wood you select to purchase. 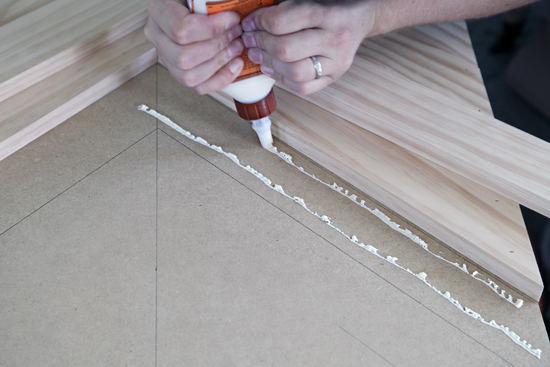 Home Depot sells the MDF (we found ours in the clearance section of the lumber dept for $8) and the pine boards. 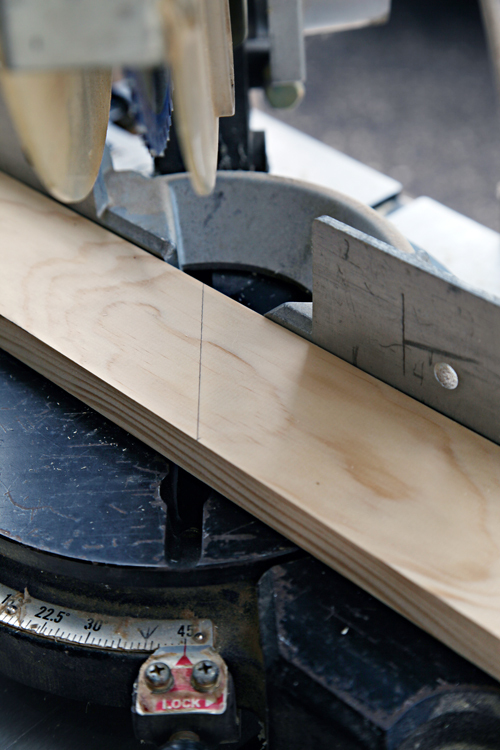 They offer a few grades of the pine boards ranging from around $1.05 - $3.15/board. We opted for the more expensive boards in hopes that they would finish and stain nicer, so that really increased our end cost. 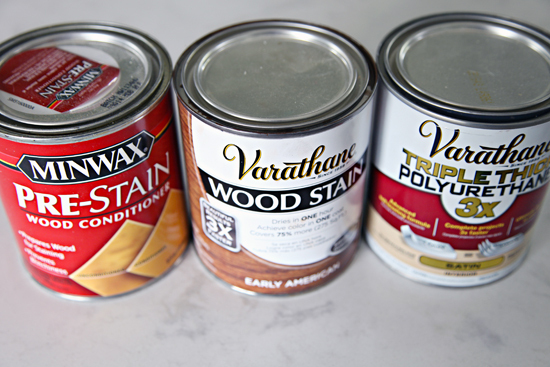 We already had the pre-stain, poly, glue, sanding block, etc.. from other projects and I purchased a new can of stain for around $7. Total we spent around $68 for all of our materials. Did you sew the pillows yourself? Love the fabric. Thanks for the link, I had no idea. I always thought the line down the center of the chevron pattern gave it more of a herringbone effect. Still love this version however, a little less busy than technical herringbone. AMAZING! I love this as a headboard, but I'm also thinking it would be an awesome accent/fireplace wall. Can you tell me where the radio/ clock item on the nightstand is from? Thanks! Wow Jen - this is seriously amazing! Great work on this project. I love the color and the design.